Once upon a time, there were two orphans that dreamed of finding adventure in life. And so, one day, they ran away and set forth on a grand journey. Woken up at their campsite by an old man who has lost something very important to him in the forest, it’s an adventure that starts in an expectedly straightforward manner before you take to the skies to unravel the many mysteries that surround the Milky Way Globe. It’s hard not to feel sorry for Poi: Explorer Edition, a colourful 3D platformer that managed to somehow mistakenly release alongside Super Mario Odyssey and has since been completely overshadowed by the moustachioed icon’s globe-trotting adventure to rescue Princess Peach from Bowser’s wedding plans. And that’s a shame because there’s much to enjoy from the chance to explore its uncharted lands. After deciding whether to play as the, for some reason, nameless male or female character – a momentary choice that you can freely change later on – your early time with this grand adventure will teach you how to jump (A Button), double jump (A Button while in the air), run (X Button), and control the camera (Right Stick). This leads you to reach where the old man’s shiny item has been left, acting as a non-fussy tutorial before throwing you into more wide-open areas to explore and become lost in. It turns out that the ‘very important item’ that you recover is an Explorer Medallion that the old man had once travelled the world collecting when he was younger. The mystical treasure that he had longed to find was the Milky Way Globe, but when his airship was caught in a very bad storm he was knocked unconscious and woke to discover that all of the Explorer Medallions that he had collected were gone. No longer agile enough to leap and climb around the world of Poi, it, therefore, falls to you to recover them all. After the old man’s airship soars up to The Sky, which is a central hub point that’s situated between the areas that you will explore, you are able to push or pull the steering wheel to choose your destination. With Cozy Canyon as your first stop, it’s hard not to notice the unmistakable Super Mario 64 throwbacks in the game’s design. When you head to any location in Poi’s skyborne world, you choose a particular Explorer Medallion to hunt out – just like the Power Stars in the Nintendo 64 adventure. Once safely retrieved you return to the airship, hand it over to the old man, head back in for another, and repeat. Those Super Mario 64 nods don’t end there, either. You soon come to realise from making your way around the game’s levels that you can rely on a triple jump, wall jump, long jump, and even a cartwheel flip – moves that all have distinct, moustachioed flair about them. The Explorer Medallions are the most important item on your adventure to become a true Master Explorer, gating you from exploring the other areas until you collect enough. But other airships will also appear in The Sky as you hoard more, effortlessly floating over to them with the Explorer Sail presenting the chance to unlock Challenges that you are blasted to in an enormous cannon – the likes of which that would make the Fettucini Brothers Circus on Mêlée Island proud – that will reward you with more Explorer Medallions on completion. It’s hard work as an official Explorer-in-Training, and, in looking to throw a few more gameplay mechanics into the mix, the old man soon lends you his old Explorer Tools if you hand over enough coins – he needs to eat, of course! We’re told that some will help you to navigate levels while others will give you more ways to explore, whether that be the telescope that lets you scout out your surroundings or the compass that will help you stumble upon secrets. And then there is the shovel that can be used to dig up fossils (with names like Crusty-acean, Stuffed Popper, and Trilobite) that can be taken to an archaeologist in Mount Magma, a camera that lets you snap photos, and others that let you carry more coins or permanently increase your health. These will aid your survival and fuel your curiosity as you become sidetracked by the secrets that have been hidden in each level. 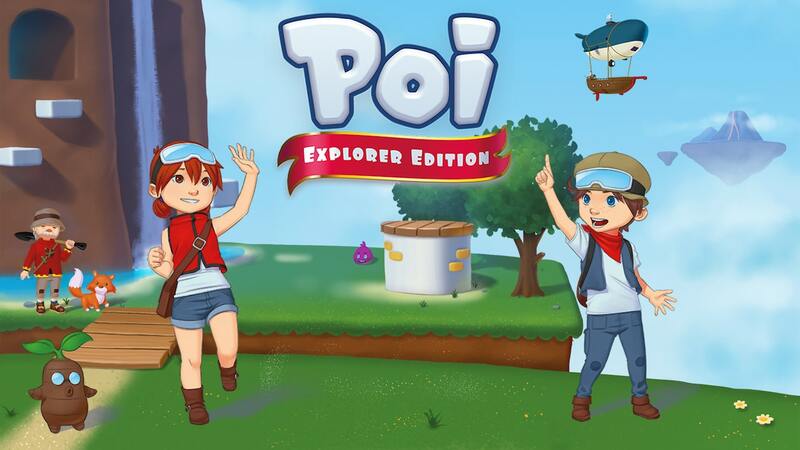 But while the game’s minimalistic visuals carry some style, it’s hard not to feel that Poi: Explorer Edition looks generic – rescued ever so slightly by the quirky characters that inhabit its world. The soundtrack was met with that same sentiment, never really swelling to anything that became remarkable to listen to. The Explorer Edition includes an unlockable soundtrack, digital art book, new costumes and hats that are exclusive to this Nintendo Switch port, which are extras that I will always appreciate. The developer has also worked on HD Rumble support and motion control input, that, while a commendable effort, isn’t really something that adds much to the experience in a meaningful way.